Note: Do not read on if you have not seen Season 6, Episode 15 of CBS's The Good Wife, titled "Open Source." It's election day tonight, guys! I have a strong feeling that Prady wins, because he's more moral, according to Alicia. And either way, she already won by pulling her campaign just a little closer. How can Good Wife be this smart? The idea of running Alicia against a person who is more moral than her… so wonderful. I missed Will so badly last week, but this is a nice distraction, right? Last week, Prady went after Peter to smear Alicia, but she and her man teamed up to tackle it. It's a beautiful thing that she's technically moved on from him. I suppose the whole show is premised on the fact that she was always detached from Peter, but not -- it's professional and personal. The trial plot gathered all of my faves: Diane and Her hubby McVeigh. Cary and Finn were bantering. And Nancy Crozier as opposing counsel. Can we say old school? Canning is dying and asks Alicia to give all of money to the family of his donor, but they are apparently tied to Hamas. Or so says David Lee. Even the scheming was a throwback. Except that Alicia leaves him writhing in bed, begging for the remote as punishment. Saint Alicia would never have done that. Hm. Maybe I'm wrong and she does become State's Attorney. One thing was missing: mucho Kalinda. She was there, but not there. This is her last season, so I guess its good for them to taper her off instead of, well, shooting her in a courtroom like last season. - Grace ? What are you doing ? Let me know what you thought @karenfratti. 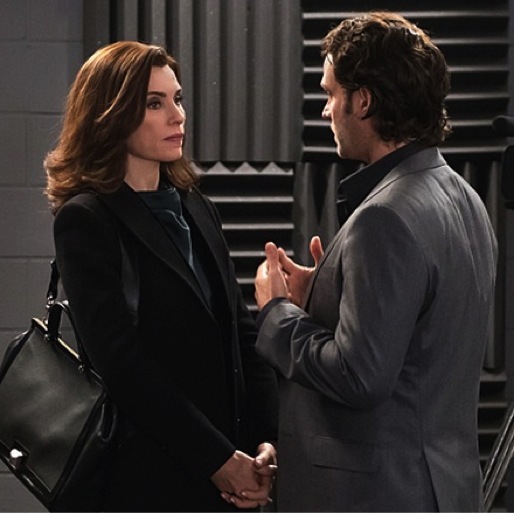 The Good Wife airs Sundays at 9 p.m. ET on CBS.